GlassWire 1.2.96 is now available for download. 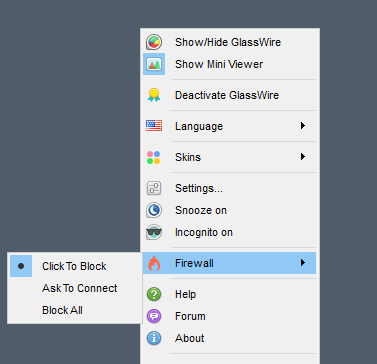 This update allows you to easily switch firewall modes by right clicking the GlassWire icon in the bottom right Windows tray area. Thanks for requesting this feature in the forum so we could add it for you! The year is now added to the GlassWire network tab. Three security upgrades were made due to HackerOne bug reports. We fixed a problem where a network scan could cause the GlassWire service to crash. We added protection so third party DLL files can no longer interact with GlassWire and cause it to crash. Getting .dmp files on your desktop? This update should solve that for you. Download GlassWire 1.2.96 now to upgrade! Attempted to update to Glasswire 1.2.96 on Windows 10 laptop – it uninstalled my previously licensed version & then the install failed. Tried shutdown & then reinstall same results & the previous install V1.2.? also gives the same fail message: “Error opening file for writing C:ProgramFiles(x86)/GlassWire.exe …” As the Administrator on the PC I can’t read or delete this file & your update won’t install. – what’s the fix? Could you post to our forum, or contact our helpdesk? Sorry for the problem.